If your school does not want to use, or does not qualify for Sporting Schools funding, you can still run the program in Term 2 at your school. Ski and Snowboard Australia can step you through this process. More information is below on costs and contact details. Why bring Little Shredders to your school? Participants: 22 per session. If there are more children in the one class then a second kit needs to be rented. Inclusions: All equipment, lesson plans and an online coaching portal are provided. Spooner Board Packages for Sale! The Spooner Board is a popular piece of equipment that is used in the delivery of Little Shredders. It requires balance, co-ordination and elite foot work to master. 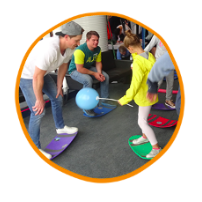 Introduce them to your PE classes to mix things up and create new and challenging games! SSA is offering a heavily discounted package of 10 boards for $250 including shipping to your school. RRP of a single Spooner Board is $85, this represents a saving of $600. Contact Us to Order your Spooner Boards.